Cornbread, warm from the oven, is such a treat. It has a lovely golden brown cracked surface with a crust that is nice and crispy, yet inside the texture is soft, dense, and crumbly. Some like to serve it with their meal, instead of a yeast bread. It also makes a nice accompaniment to soups, stews, and salads. You can use it for your turkey stuffing or I like it in the morning for breakfast, served with some sweet butter and strawberry jam. In America, how you like your Cornbread can depend on whether you live in the Northern or Southern States. For example, Northerners normally prefer to use yellow cornmeal and also like to add a little sugar to the batter. Southerners, on the other hand, like white cornmeal, and no sugar is allowed. When I set out to make Cornbread, since I'm Canadian with no predetermined ideas of what it should taste like, I just experimented with different ingredients and amounts until I came up with a Cornbread with a taste and texture I enjoyed. First, I like to bake the cornbread in a fairly hot oven and while a baking pan does produce a nice cornbread, I prefer to use a cast iron skillet (called Skillet Cornbread) as it gives the cornbread a nice crisp and crunchy outer crust. Then, for the batter, I like to use 1 cup (120 grams) white cornmeal (can use yellow cornmeal) and 1 cup (130 grams) all purpose flour. (You can change the ratios of cornmeal to flour. More cornmeal will give you a denser, more gritty and crumbly bread. More flour will give you a more cake-like bread.) Then, I have to admit, I like to add a little sugar, so feel free to leave it out. For the liquid I used equal amounts of buttermilk and milk. (You can change the ratios of these two liquids. 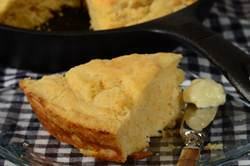 Buttermilk gives a more bread-like texture to the cornbread, milk makes it more cake-like.) Then an egg and some melted butter (can use bacon fat or vegetable oil) are added for texture, flavor, and coloring. If you like you can add some fresh rosemary, ground cumin, chopped chilies or jalapeno peppers to the batter, or some grated cheese or fresh corn kernels. Before the batter is poured into the cast iron skillet, some butter (or bacon fat, shortening, lard, for oil) is put in the skillet and the pan is placed in the oven for about five minutes. This allows the butter to melt and heats the pan so it nice and hot. Then, when you pour in the batter, the extra butter is pushed up the sides of the pan which makes the outside crust of the cornbread so wonderfully crisp and crunchy. Note: Cornmeal is made from white or yellow corn kernels that have been ground and dried. If some of the germ and hull are included in the cornmeal, it is called 'stone ground' cornmeal. Stone Ground Cornmeal tends to have more 'corn' flavor and a more gritty texture. Cornmeal, when used in baked goods, adds a slight crunch and gives it a coarser texture. You can use polenta or maize meal instead of the cornmeal. Cornbread Recipe: Preheat oven to 400 degrees F (200 degrees C) and place the oven rack in the center of the oven. Then put 2 tablespoons (28 grams) of the butter in an 8-9 inch (20-23 cm) cast iron skillet (or baking pan) and place in the oven for 5 minutes (to heat the pan and melt the butter) while you make the batter. In a small saucepan, or in the microwave, melt the remaining 2 tablespoons (28 grams) butter. Set aside. In a bowl, with a wire whisk, lightly beat the egg and then stir in the buttermilk and milk. In a large bowl, whisk together the cornmeal, flour, sugar (if using), baking powder, baking soda, and salt. Then make a well in the center of the flour mixture and pour in the egg/milk mixture, along with the melted butter. Gently stir, just to combine. The batter should be thick, but still pourable. Add more milk or buttermilk if necessary. Remove the skillet from the oven and tilt the pan so the butter coats the bottom and sides of pan. Pour the batter into the skillet and bake in the oven for about 20 - 25 minutes, or until the top is golden and cracked, and a toothpick inserted in the center comes out clean. Remove from oven, place on a wire rack, and let cool for about 10 minutes before serving. This bread is wonderful served warm, whether with your meal, as a snack, or with butter and jam.